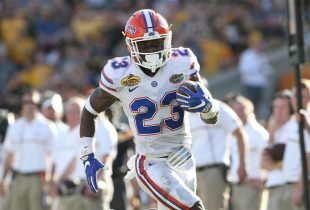 Florida Gators basketball trailed for nearly the entire game on the road against the Missouri Tigers on Saturday afternoon. And while Florida did grab a lead before halftime, it was down by a significant margin late in the contest and found itself tied with Mizzou after making a couple of free throws with 22.2 seconds left to play. 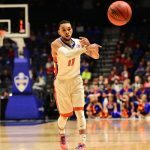 The Tigers began their final possession of the game with just over 17 seconds remaining, but as Missouri was setting up to run a play, UF senior point guard Chris Chiozza intercepted the dribble, drove down the court and laid the ball into the hoop for a walk-off layup. The ball left his hands with 0.7 left, landed with 0.1 to go and clinched a fifth straight win for the Gators. Florida’s 77-75 victory puts it at 2-0 on the road to open SEC play. Not a bad start for a team that looked to be falling apart just a couple weeks ago. Fantastic win on road. Cheeze…. clutch man again. Keep that suit jacket on Coach White. Enjoy the trip home guys.